So I am planning a camping trip next weekend and thought what is the one quintessential food that you need on a camping trip… beef jerky of course! Haha I know I know it’s actually s’mores and hotdogs isn’t it? But I figured that beef jerky would be a great snack for around the fire at night. 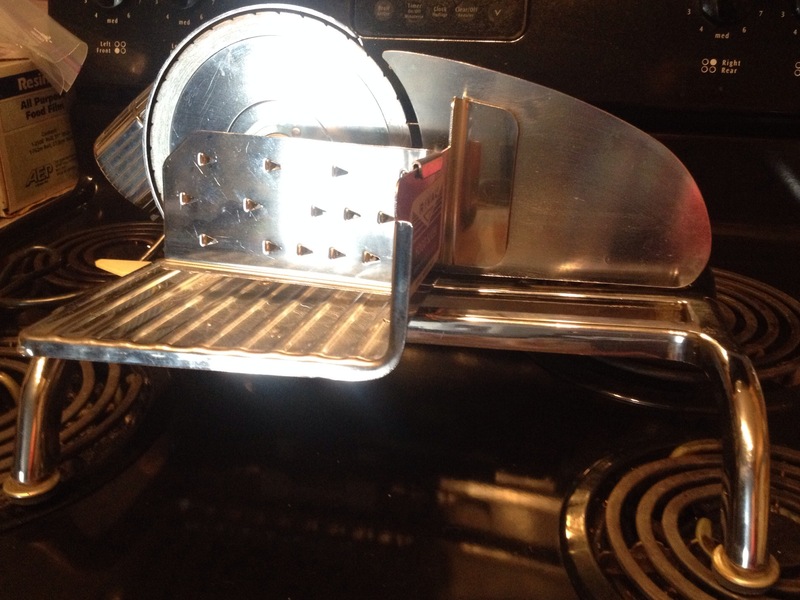 About a month ago I acquired a meat slicer from my hubby’s grandparents. It’s an old stainless steel one and I love it! This was the perfect opportunity to try it out. 🙂 If you have not acquired a meat slicer from your grandparents as I have you can still make this recipe, you’ll just have to hand slice the meat. The dehydrator I have is from Cabela’s. 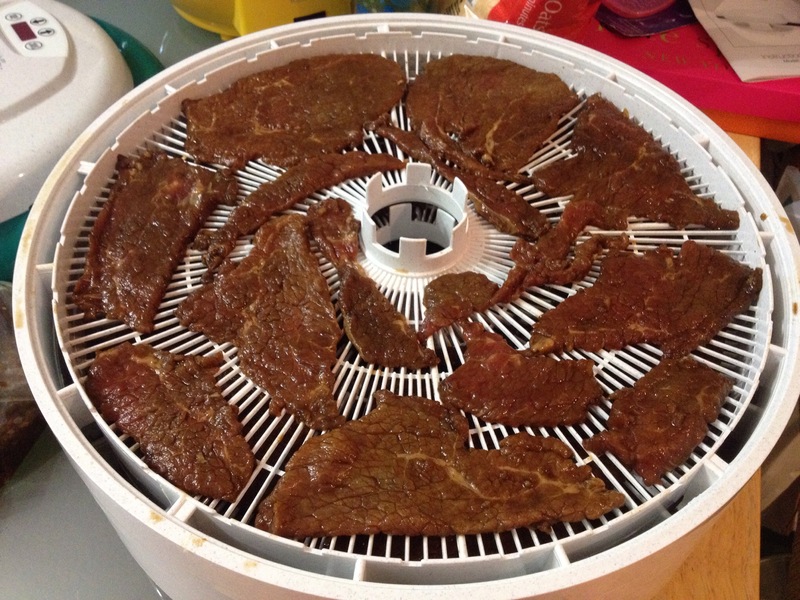 It’s the Open Country 1000W Dehydrator. 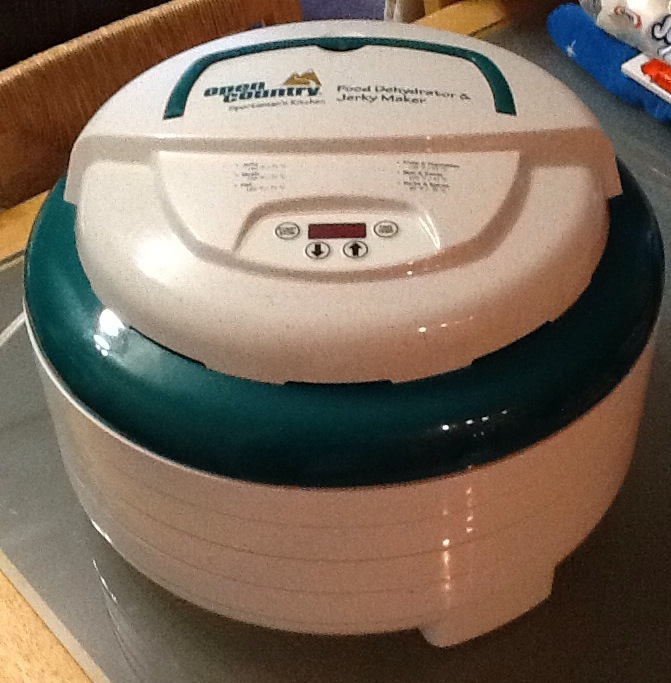 It came with 4 trays but you can add up to 20 trays so you can make jumbo amounts of jerky! – Put the roasts in the freezer for about 20 mins, this will make it easier to slice. 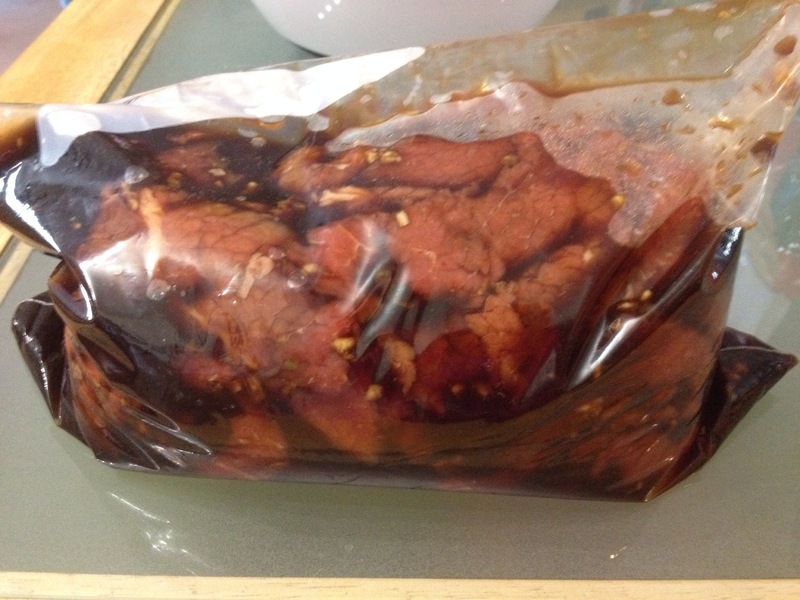 While they are in the freezer use 2 large plastic freezer bags and put all the ingredients for each marinade into separate bags. Seal them and mix it up. 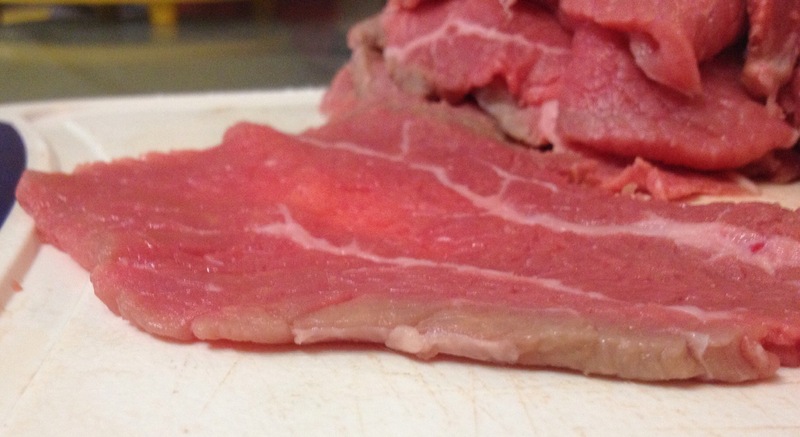 – Slice the roasts, against the grain, into about 1/4 inch slices and place into the bags with the marinade. Put in fridge and let it marinade for 12-24 hours. – Lay slices in a single layer on your dehydrator trays. Turn on dehydrator to 160F and run for 4 hours. Check at 4 hours and remove the pieces that are done, turn the other pieces and let dehydrate for another 30 minutes or more depending on how dry the pieces left are. Recipe note: Next time I will try cutting the beef a little bit thicker since I thought the jerky turned out a bit thinner than I would have liked. On my way home from work the other day I had a sudden urge for some smoked ribs so I quickly pulled over and pulled up the Urbanspoon app on my phone and checked what was in my area. The closest BBQ place to me that was open was the Smokehouse BBQ so off I went in that direction to satisfy my craving. 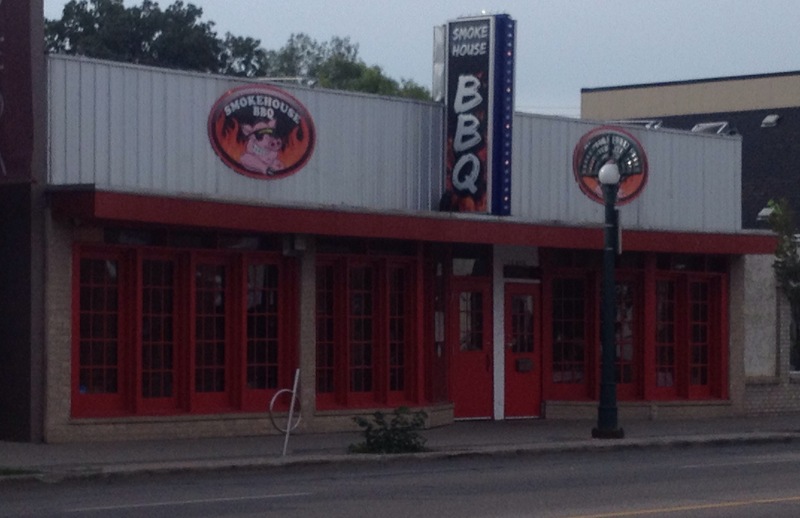 The Smokehouse BBQ is located on 124 St & 108 Ave. 124 has really become a hotspot for some good eats. When I pulled up and took at look at the place it was a cute little place, they have big red windows that were open right up to give the patrons near the front a patio vibe. As soon as I walked in I was greeted by a friendly waitress and I let her know I was there for some takeout. She ushered me to sit at the bar with the menu and asked if I wanted something to drink while I decided what I wanted. I took a glass of water since it was a scorcher of a day and proceeded to gander at the menu. It’s not a huge menu (which I think is a good thing) but it does have a good enough selection of items. I quickly choose the Big Daddy Combo since I already knew I wanted ribs. This meal comes with 2 meats and 2 extras. For meats you can choose between pulled pork, pulled chicken, beef brisket, andouille sausage, ribs or a bacon bomb. The extras to choose from were french fries, Cajun potato salad, coleslaw, sweet potato smash, baked mac n’ cheese, baked beans, spicy hand-cut potato chips and corn bread. 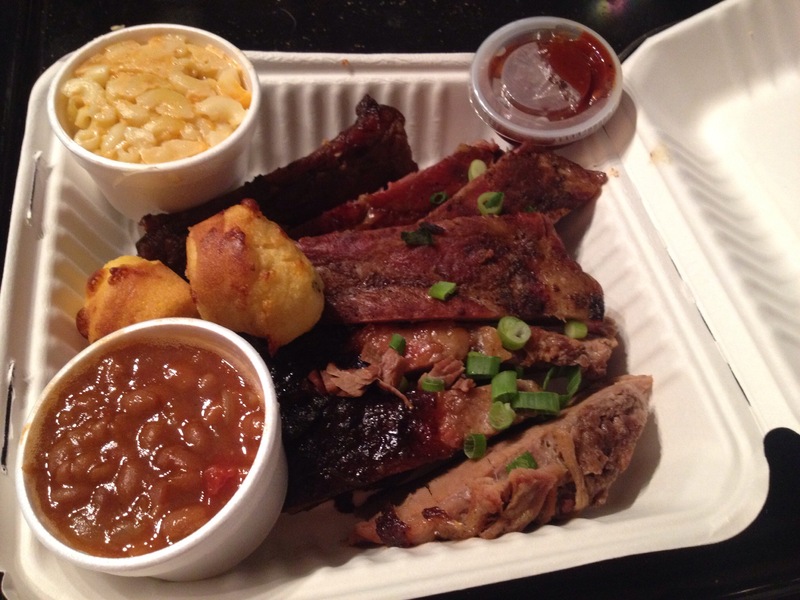 I choose the ribs (duh) and the brisket for my meats and the baked beans and mac n’ cheese for my extras. I gave my order to the waitress and pulled out my phone to scroll Facebook while I waited. The food didn’t take long, maybe 5 mins to come out. While I was paying the waitress let me know that through Dial and Dine they offer delivery so depending on what area of Edmonton you live in you may be able to get delicious smoked meats right to your door! So off I went carting my bag of tasty smells home to enjoy. And tasty smells indeed they were! All the way home I could smell the yummyness coming from the bag sitting on the passenger seat. When I got home and opened up my treasure chest of treats I was satisfied with what I saw. There were 4 ribs and 4 decent sized pieces of brisket, a side of BBQ sauce, the sides came in little containers and there were 2 little cornbread muffins as well. Personally I think the sides were a little on the small side considering the meal was $18.95, perhaps when you dine in they give you more. Also I am pretty sure they have more than 1 choice of BBQ sauce but with takeout it would be difficult to give you them all so they must just give the original sauce, which was pretty decent, nice and flavorful. I dug right into the ribs and they were very tasty, nice and smokey. The brisket was also delicious. I feel like the mac n’ cheese left a little to be desired. The baked beans were good as well, smokey and had just a touch of heat. Overall I would say that the Smokehouse BBQ is a winner! Tasty food and great service. I will be going back again for sure. Well now to get to my first recipe! 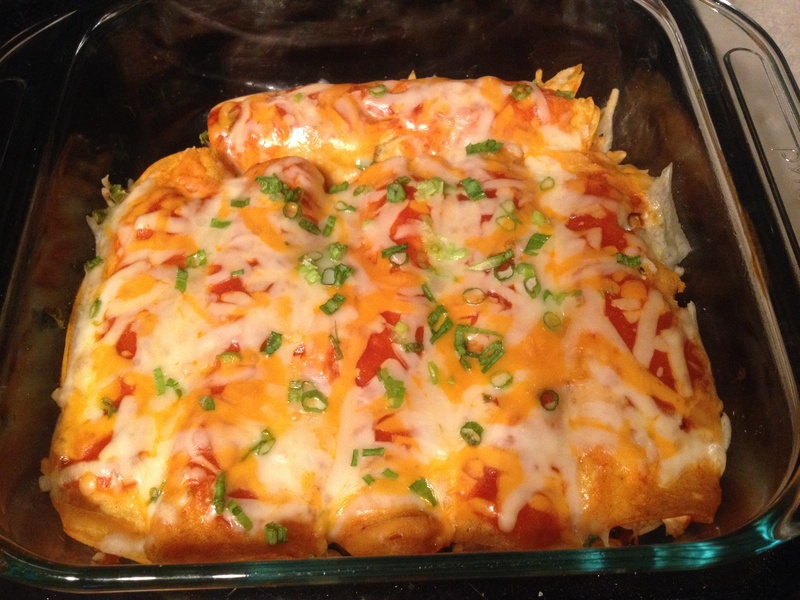 I love Mexican food and this recipe was an easy meal. I try my best to eat a clean, real food diet and even though this recipe uses canned and ready-made food I still feel like it falls into my ‘rules’ of clean eating because the products I chose didn’t have any unpronounceable ingredients. – Preheat oven to 350F and lightly coat a 9×9 pan with some oil. I use one of those pump and spray things since I do not like the chemicals used in the aerosol sprays. – Remove skin from chicken & shred the meat with your fingers. In a bowl combine the shredded chicken with about 1/3 of the can of enchilada sauce, the chopped cilantro and the lime juice. If you like a little bit of heat add the jalapeno here as well. We didnt this time but I think next time I will give it a try. – Heat up a non stick pan with a bit of oil (about 1 T), then in a shallow dish (I used a pie pan) pour about 1/3 of the can of enchilada sauce (you should have about 1/3 remaining for topping them later). Now one at a time take each tortilla and dip it into the sauce to lightly coat it, then go ahead and put it in the pan to give it a light fry, they only need about 5-10 seconds on each side and be gentle with them as they will get really soft. Remove the tortilla from the pan and spoon some of the chicken into a strip in the middle then roll the tortilla up and place in the 9×9 pan. continue with the rest of the tortillas. 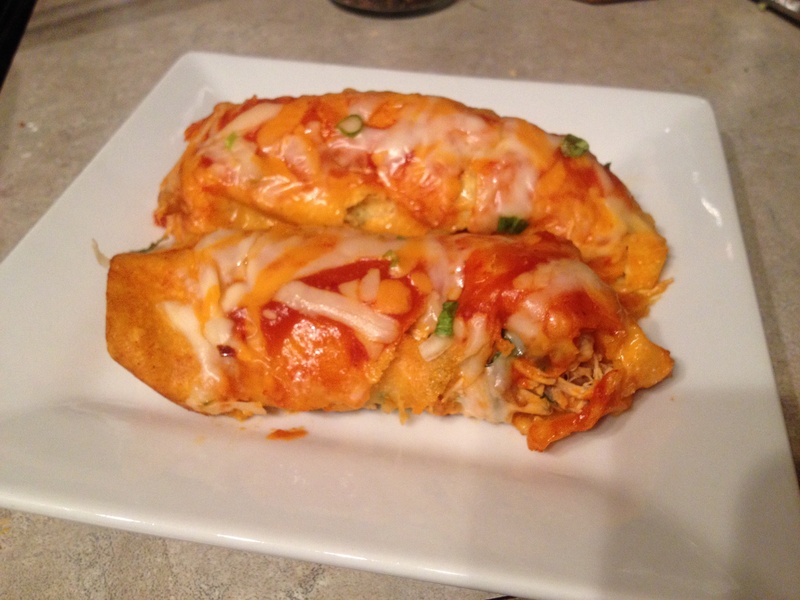 Once all the tortillas are nicely fried, filled and rolled spoon the rest of the sauce over the tops of the enchiladas then sprinkle with cheese and chopped green onion. – Put into preheated oven and bake for about 15-20 mins until the cheese is melted and they are heated through. Serve with a dollop of sour cream. Enjoy! My recipe thoughts… I think next time I make this I will try to spice it up with a bit more heat. It had good flavor the way it is but since I didn’t add the jalapeno (the jalapeno was an after thought suggested by my husband) it was about a 1 one on the spicy scale . If you’re a vegetarian or want to use this for a meatless Monday dish I would recommend to use refried beans instead of chicken. Well there you have it, my first blog post. I hope you give this recipe a try and give me your feedback.